If Lord Justice Leveson’s recommendations are implemented in full, does that mean that it will be easier for police officers conducting investigations to seize confidential research materials from journalists? The idea has gained some currency, but the answer to the question is no. In his report, Leveson writes (part J, chapter 2, paragraph 9.3 onwards) about submissions made to him by Deputy Commissioner Craig Mackey of the Metropolitan Police (MPS) in which Mackey makes the case that under the Police and Criminal Evidence Act (known as PACE) ‘journalistic material’ is in some ways placed further beyond the reach of the police than material gathered for professional reasons by solicitors. Mackey argued that this was wrong and suggested specific changes to the law that would place weaker barriers in the way of police wanting to seize journalistic material. I am very conscious that I have received submissions only from the MPS on this topic and that there is potential room for argument that any amendment to PACE will have far wider ramifications of which I have not been apprised and go beyond the limited goals that DC Mackey seeks to achieve. Before any conclusion can be reached on any of these issues, appropriate consultation will be essential. In the circumstances, without pre-judging any conclusion, I recommend that the Home Office should consider and, if necessary, consult upon (a) whether paragraph 2(b) of Schedule 1 to the Police and Criminal Evidence Act 1984 should be repealed; (b) whether PACE should be amended to provide a definition of the phrase “for the purposes of journalism” in s13(2); and (c) whether s11(3) of PACE should be amended by providing that journalistic material is only held in confidence for the PACE provisions if it is held or has continuously been held since it was first acquired or created subject to an enforceable or lawful undertaking, restriction or obligation. In the context of the whole report – where the judge is often very firm on what he wants to see done – this amounts to a tentative and diffident prompt. The Home Office is not asked or instructed to change the law as Mackey suggests, but to ‘consider and, if necessary, consult upon’ changing the law. Leveson stresses, moreover, that he does not pre-judge any conclusion, which is another way of saying that if the Met’s changes are rejected as a result of consideration or consultation that is fine with him. So let’s be clear. 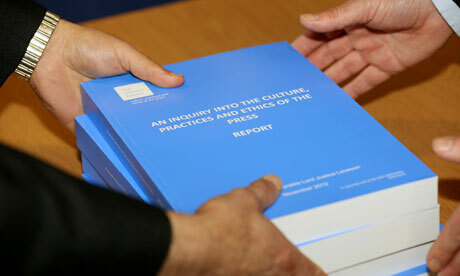 Leveson did not recommend making it easier for police to seize documents from journalists. He said he had heard one half of the story on this matter and he politely suggested to the Home Office that it should consider getting the whole story. The Home Office has initiated that process and is seeking precisely those opinions on the subject that Leveson acknowledged he had not heard. If anyone does not want PACE changed in the way proposed by Deputy Commissioner Mackey, therefore, they should tell the Home Office. Hacked Off will be making a submission to this consultation. We are seeking legal advice, but at the moment we do not like the look of parts of the Mackey proposal. If, after consultation, the Home Office decides to proceed with some or all of the proposed changes it will have to come forward with legislation that will in turn have to be debated in public, in the press and in both houses of parliament. We are a long way from that, and any such legislation would be the responsibility of the government and not of Lord Justice Leveson. I remain (as I started) firmly of the belief that the British press – all of it – serves the country very well for the vast majority of the time. There are truly countless examples of great journalism, great investigations and great campaigns. The exposure of thalidomide, the campaign to bring the killers of Stephen Lawrence to justice,the exposure of abuse in the operation of MPs expenses are but the best known in a long list. The press describes world and local events, illuminates political issues and politics generally, holds power to account, challenges authority, investigates and provides a forum for debate. It is not necessary or appropriate for the press always to be pursuing serious stories for it to be working in the public interest. Some of its most important functions are to inform, educate and entertain and, when doing so, to be irreverent, unruly and opinionated. It adds a diversity of perspective. It explains complex concepts that matter in today’s world in language that can be understood by everyone. In no particular order, it covers sports, entertainment, fashion, culture, personal finance, property, TV and radio listings and many other topics. It provides help lines and advice; it supports its readers in a wide variety of ways. It provides diversion in the form of crosswords, games, and cartoons. In short, it is a very important part of our national culture. Isn’t this a bit complacent? It’s fair enough to point out that Leveson was merely passing on a police request, but why focus on the judge at the expense of the arguments against the substance of the PACE reform suggestion by the Met. I doubt most journalists care whether or not LJ Leveson was involved in drawing up this idea. The point is that if police have the power to delve into reporters’ notebooks then it could have a serious impact on people’s willingness to give them information. The time to resist this is at the point when the Home Office is consulting on the matter, not when it has built momentum. This sort of disingenuous argument is the reason Hacked Off’s occasional bouts of piety about the usefulness of a free press ring hollow with so many journalists.